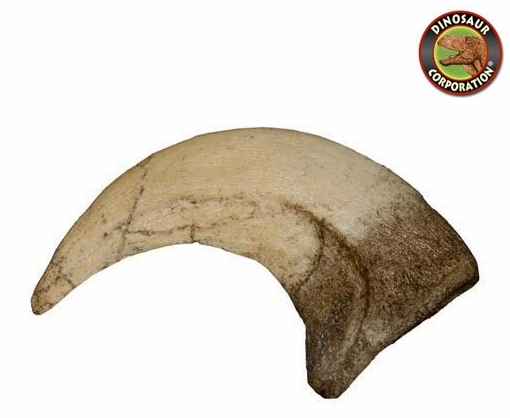 Velociraptor Raptor Claw of the vicious killer dinosaur from the Late Cretaceous Gobi desert of China and Mongolia. Velociraptor was a mid-sized dromaeosaurid, with adults measuring up to 2.07 m (6.8 ft) long, 0.5 m (1.6 ft) high at the hip, and weighing up to 15 kg (33 lb). The skull, which grew up to 25 cm (9.8 in) long, was uniquely up-curved, concave on the upper surface and convex on the lower. The jaws were lined with 26 - 28 widely-spaced teeth on each side, each more strongly serrated on the back edge than the front possibly an adaptation that improved its ability to catch and hold fast-moving prey.